And the faux Honey and her boyfriend disappeared from the pond during our big thunderstorm. Before they left I got a decent photo, and could see her beak markings. They don’t seem to me to resemble the ones of the real Honey (at bottom). Or do they? See the enlargements at bottom. Readers, please help me out! This entry was written by whyevolutionistrue and posted on October 16, 2017 at 7:15 am and filed under boots. Bookmark the permalink. Follow any comments here with the RSS feed for this post. Both comments and trackbacks are currently closed. My vote is in. The tally is tied but the sample is as small as they get. Not the same bill. Clearly a honey wannabe. Looked the same to me, but I don’t know diddly about duck bills. I’m pretty sure that is Honey. There are some distinctive patterns on both bills that are identical. The lighting is quite different and may confuse things a bit but there are at least 2 or 3 distinctive marks that clearly match. The odds of these markings matching from two different ducks seems excruciatingly unlikely. Yes, that’s what I think, but of course I’m biased. The blotching patterns seem very much the same. If this is true, that means she came back with her boyfriend! Bringing the new boyfriend back home to meet the parent! If it’s Honey, she put on some nice blue bill makeup for her new beau. Yes, but she did not reply to your whistle. Which means, if it is the same duck, she prefers the whistle of another male. Say it ain’t so. I think it’s Honey too. The lighting is different, but comparing several points of the actual markings, they look the same. I voted no, but on deeper examination, I think the differences are due to lighting. but those boots: my, my, … … my, my, my ! But are those boots comfortable for walking any distance? Those soles look tough on the feet. Are they easy to clean? What you need here is falsification, i.e. compare with bill of other ducks to see if they look similar and to assess if such a pattern is common enough. I know virtually nothing of Mallards. Maybe all Chicago ducks have similar bills, maybe they are all different. Maybe Honey’s bill pattern is common. I don’t know. I looked at a few on and they looked different from those two, and these two look somewhat similar. The shape is alike, just one more washed out. No, because I have photos of the other side of Honey’s bill, which is very different. Not the same Duck, those Boots are great,Had a pair that lasted for years until they couldn,t be worn any more. The feather colouring of the eye-stripe seems more set-off against the background in the new duck. That’s Honey all right. Don’t believe all those no voters. Me too. It was tough to decide. Can anyone confirm or deny that duck bill coloration remains stable throughout the year? Perhaps a young eager grad student should be put on the case of the disappearing duck, or maybe next year some leg banding just to be safe. A rose by any other bill stippling would smell as … duck-like? As your boy Steve Stills would say, love the one your with. You know why it matters. She’s my duck and I helped her bring her babies up. Does not nurture kinship apply here. There’s a fascinating research project here. I already have a title for our cover article in Nature magazine: “The Accuracy of Crowd-Sourcing in Duck Identification by Bill Pattern Matching”. All we have to do now is get a research grant. And ducks. Lots of ducks. I nominate PCC(E) as Official Duck Wrangler for the project. I voted ‘no’ but I am a bit unsure. Maybe the scattered spotting pattern of a youthful ducks bill can fill in with a more contiguous color? I spent some time in PowerPoint, matching the two bills for size and angle, and super-imposing one on the other to see if the colors match. I gotta say the match is pretty good, down to some details even, if the spotting can merge together over time. 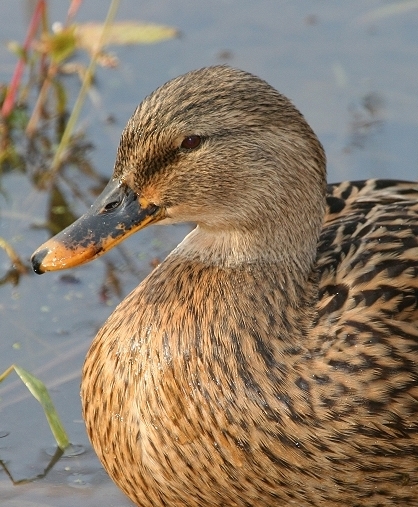 But I also compared the bills to female mallards on the internet. There is variation, but I found at least one that is pretty close to the Mystery Duck. So some matching could be a coincidence. And Honey should know you! That should carry some weight. I… I don’t know for sure. In one sense I built my career on pattern recognition (peptide maps and later amino acid sequence comparisons), but without some idea of the range of bill patterns it’s hard to say. Basically as Aneris said @ 7 above. So I Google Imaged for female mallard bill and came up with things like this. And on that basis I’d say this was Honey. Strange she didn’t come for eats, tho. You don’t feel hungry when you’re with the one you love! Well, I don’t anyway. She turned her head to Jerry’s whistle and the drake didn’t, so I reckon that says something. Same bird! I would bet a bottle of single malt whisky on it and I only make whiskey bets when I am certain; otherwise it is a beer bet. Bird beaks can change colors pretty quickly (‘dynamic’ coloration unlike the more ‘static’ situation for plumage color. There are a couple of pigment spots that are identical and the latest photo has those markings while other areas simply got darker. I dunno. This looks like one for the forensic team at CSI: Duckpond, Chicago. It is the same duck! After looking at photos of many female mallard bills, none of them look remotely like these two. I reckon it’s Honey. The area directly next to her head looks almost identical in each photo. That’s what I’m thinking I need before I decide….. more data! That was how I voted. I voted ‘No’ based not on markings which probably change through time, but on the shape of the nostril. Honey look alike has lighter-colored feathers around throat. No. Keep in mind that (1) Honey is soaking wet and “New Duck” is dry, and (2) lighting conditions aren’t necessarily the same for both photos. Yeah, you’re right. Same bill pattern in the same pond–what are the odds? Must be Honey with a new honey. The cycle of life will go on. They both seems to have the “motorcycle pursued by a groundhog” pattern on its bill, therefore my veredict is “definitely maybe”. I love the boots. Reminds me of home and my dad…El Paso was home for 18 years. Love them boots! Do you check eBay often for cowboy boots or did you just get lucky? I love eBay myself, and have found many great deals. I used to check daily but now I’m full up with boots and don’t check any more. But before I stopped buying them, I got some absolutely fantastic deals. Email me and I’ll give you several names you should be searching for. I think this calls for a facial recognition device to solve this mystery. Maybe they have this at O’hare so just run the duck over for a check each time she shows up. The marking at the base of the bill, where the bill meets the head is different and markings going from the eye and under the eye are to me , not the same. Honey’s bill has many blackish spots and the new duck’s bill has one blackish patch. I would say no but I’m not sure if the pattern gets darker over time. Had some time at lunch so I took out my handy dandy ruler and made a series of measurements of anatomical features on both ducks. For example, I measured width of the gap in the splotch at the back of the beaks on both ducks. I measured the lengths of the long splotch at the front. I measured distances between a point not he edges of the eyes and the nostrils to various points on the beak and the head. Things like that. In total, 10 measurement on both ducks. I made a matrix of these data. I then measured the width of both birds eyes and nostrils. I then normalized all the other metrics data in the matrix to each of these. ….the photos are of the same duck. One caveat – one of the metrics I used is an outlier. The distance between the anterior end of the eye and the posterior edge of the nostrils differs by ~10-15% (ratios are 3.5 for one bird and 3.9 for the other) while none of the other measurements varying by more than 3%. I take this to reflect a slight difference in the angle the photos were taken. Or maybe measurement error. I was nomming a Cuban sammich, so I may have been deliciously distracted when I made that measurement. All of this could have been avoided had PCC bothered to obtain DNA samples from both ducks. Because I am channeling the religiously inclined today, I voted “yes”. Because I want it to be true, it has to be true. A duck expert has weighed in and said that these are definitely the same duck. Thanks to the expert and Mikeyc’s analysis above, I am confident that it is indeed Honey. MY DUCK IS BACK! She was gone today, but now she knows the way home. Congratulations!!! She clearly feels a strong connection to you. She will not forget. I think it’s the same duck. I’m looking at the outlines of the dark markings on the bill. Duck bill markings can slightly change color with time and wear but the general outline pretty much stays the same. Any Ornithologists out there to weigh in? There’s gotta be one who checks out Jerry’s blog. Oh, didn’t read Jerry’s above post. I voted, but, frankly, I have enough bills of my own. Now *this* is an unusual use of human “image recognition software”! Granted, I am a Texas country boy that grew up on a ranch… but I am confused by the first sentence of your post… when is it ever NOT boot weather? Nice boots, Prof Ceiling Cat (emeritus)!